WordBender is a Brain Fitness puzzle game for all ages. And it's free! WordBender was built by hand in a friendly little RV under a big droopy Californian tree. My mission with this word game is to encourage Brain Fitness - regular, healthy (and fun!) exercise for brains of all ages. Each and every Word Bender (a clever puzzler like you) helps the cause by playing/sharing this word game, but also by encouraging all those great brains around us, young & old, to stay active so we can all be sharp for years to come! Will you join us? pps. 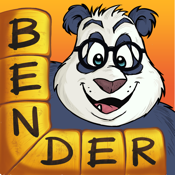 If you like free word games, free word search games, free word puzzles, word find, word scramble, word seek, words tour, ruzzle or boggle, you'll love word bender! Feedback, Support, Press Inquiries, Job Requests, Virtual Highfives..